Find Better Ideas, Faster ® with a custom weight loss trend report, our PRO Dashboard and 80+ categories of premium trend reports. The Weight Loss Trend Report is an all-encompassing rundown of weight loss trends and the many different industries surrounding them. As many consumers are looking to adopt a more healthier lifestyle, products and services related to fitness, diet and health continue to offer new and interesting solutions towards achieving a more fit and active body type. 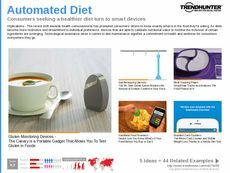 Advanced dieting smartphone apps, healthy food alternatives and personalized health and fitness services are just some of the topics covered in this report. This report is an excellent resource that's specifically targeted towards professionals looking to educate themselves on the many different new consumer trends and industry developments in relation to weight loss. Anyone involved in food, fitness or health industries will be able to harness this research and kick-start their very own weight loss-related product or service. This report is curated for anyone interested in health and fitness whose looking to better understand the many different industries able to tap into the world of weight loss through new innovation and design.